The Good Shepherd Academy compound is designed by MSAADA Architects, a non-profit architectural firm with offices in the US, Africa, India, and Haiti. With over 30 years’ experience, MSAADA and founding architect Poul Bertelsen have completed over 800 schools, hospitals, and churches in developing nations. 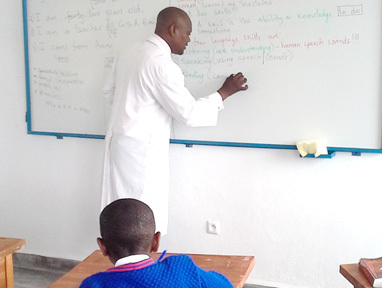 MSAADA’S unique experience and proven track record made them the ideal choice to design, construct, and supervise the construction of Good Shepherd Academy. GSA is designed as a traditional campus, with courtyards in the academic building and three student dormitories. Construction is typical of the area consisting of masonry buildings with pre-painted metal roofs. 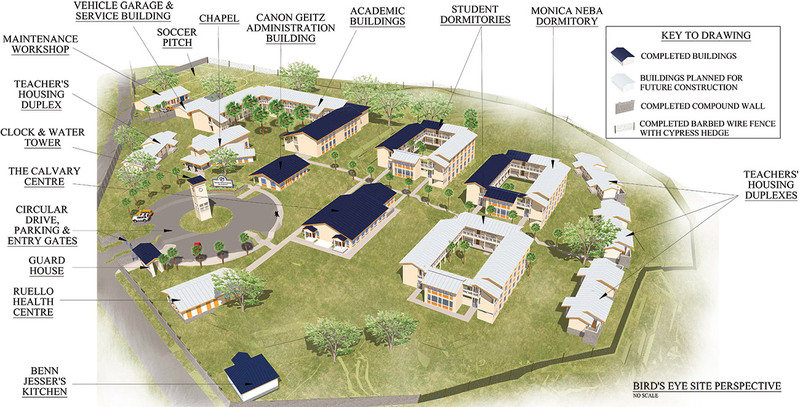 The academic building and three dormitories anchor the complex and define the campus as divided into teaching and student boarding areas, with separate areas for faculty housing and vehicle storage/service. A separate dining/assembly hall, administrative wing, and health center round out the campus proper. Care was taken to maximize passive cooling and natural lighting. The academic buildings and dormitories are typically one room deep with covered verandas and balconies for circulation. Courtyards provide secure natural gathering areas for students and faculty. Sustainable organic chicken, fish, pig, and vegetable farms are one of the means of self-sufficiency integral to the GSA community. They also have an important educational value. Self-sufficiency in terms of energy is also a goal of GSA, as photovoltaic and solar hot water panels will provide a significant portion of the energy requirements for the facility. The newly completed Calvary Centre which serves as dining hall, worship space, and performing arts center. A school is a building that has four walls—with tomorrow inside.